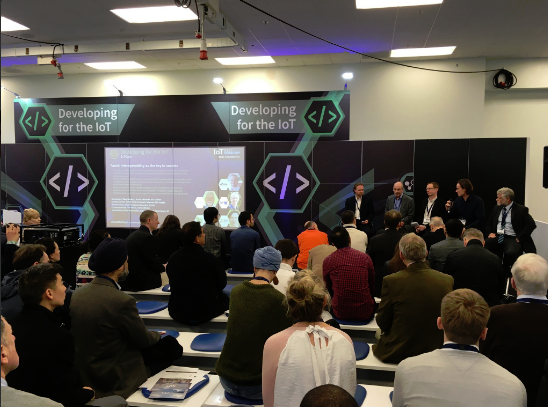 David Thorne speaking on panel discussion at IoT Tech Expo Global in London (Source: @larssonchrister). Recently, I took the opportunity to speak at this year’s IoT Tech Expo Global in Olympia, London, on a panel titled ‘interoperability as the key to success’. One of the primary focuses of the panel was to discuss the role APIs play to speed up innovation and achieve interface collaboration. HomeGrid Forum recently participated in an “Open API” event and submitted the 1905.1a (wired to wireless) open linux stack to both the Broadband Forum and CableLabs. This helped to proliferate extending G.hn as a backbone to the wireless community, in order to speed up innovation and collaboration for in-home networking. The panel also discussed how vendors need to work together to achieve standardisation across different devices. At HomeGrid Forum, we believe certification programs are at the forefront of interoperability, and the answer for vendors looking to keep up with today’s growing industry for smart home innovation. To ensure multi-vendor interoperability, accredited industry certification programs should be used for every product to provide credibility and quality assurance for retail and carrier based customers looking to add ever increasing numbers of devices to the home network. The successful global adoption of the Internet of Things is dependent on a robust and secure home network. Further, if manufacturers are to embed networking capability in large, fixed white goods (e.g. washing machines and fridges) they need to be confident that it is fully interoperable, long-lasting, and secure; there is no opportunity to change it out. I also stressed the importance of security, but this must NOT rely on any expert knowledge or configuration by the user. HomeGrid Forum provides G.hn silicon and system certification through a strict compliance and interoperability testing program to ensure the simplest and most secure means for consumers to connect their increasing number of devices and applications using the home network. HomeGrid Forum champions the push for Interoperability, Performance (IOP), and compliance testing based on real market requirements in the consumer technology industry. For more information, visit http://www.homegridforum.org.